You’ve already heard from us that sugary and acidic foods and drinks can harm your teeth. But what can you add to your diet to keep teeth healthy? At least three studies confirm that drinking green tea is good for your dental health: One in Egypt, one in Germany, and several in Japan. 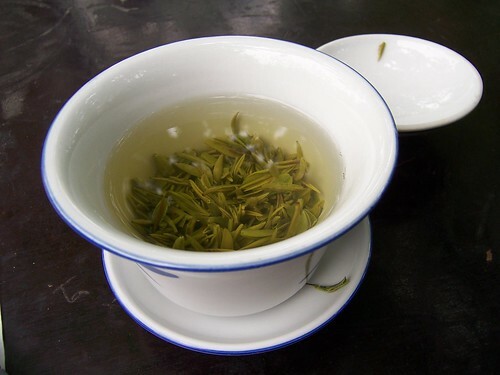 A rinse with green tea actually lowers the acidity of your saliva and kills off bacteria so that your teeth are less susceptible to tooth decay. This same rinse can also kill off the bacteria that lead to periodontal disease and bad breath. Calcium, Vitamin D, magnesium, and folic acid are all vitamins and minerals that your teeth need to stay strong. Thankfully, Brazil nuts, almonds, peanuts, and walnuts have many of those nutrients. Allergic to nuts or not a big fan? You can get the B vitamins and magnesium from whole grains, calcium from dairy products or fortified soy milks, and Vitamin D from healthy amounts of sunlight, among other options. Foods that are high in fiber produce more saliva when you chew, which helps wash away food particles and dilute any bacteria in your mouth. Chewing raw fruits and vegetables can actually help scrub the plaque off your teeth as well. Over all, eating these raw and high-fiber foods can leave your mouth with cleaner teeth and better breath. How does your diet compare to these suggestions? Want to learn more about the best foods to eat for your dental health? Check out these articles: Chew on This: 8 Foods for Healthy Living, and Huffington Posts’ Foods for Healthier Teeth.